4)No relinking of native executables. User exists (Applications C Code) is now dynamically linked at runtime. 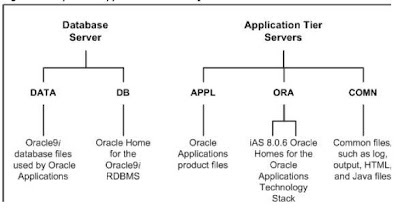 If you are familiar with Oracle Apps 11i , you can easily understand picture on your right. This is file system for 11i with various TOP's , APPL_TOP, ORA_TOP, COMMON_TOP, DB_TOP and DATA_TOP. With Multiple Middle Tier configuration came shared APPL_TOP (only APPL_TOP used to be shared ) . After shared APPL_TOP came shared Application Tier (All three TOP's on Application Tier, APPL_TOP, ORA_TOP and COMMON_TOP were shared across servers). With this came challenge of configuration files which are specific to a server mainly iAS & 806 configuration file. If you have configured Shared Application Tier (sharing ORA_TOP as well) in 11i then this problem was overcome by creating conf directory in COMMON_TOP. 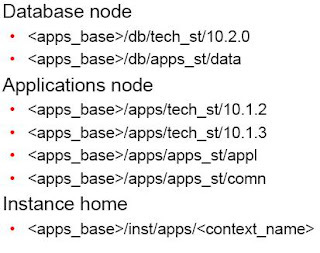 In Oracle Apps R12, You can see new TOP called INSTANCE_TOP in Application Tier. This TOP will now hold any configuration files (specific to that server) , Certificates (If SSL is enabled SSL Certificates & any other certificates specific to that server) and related log files or pid files (for Apache or any other process). In diagram tops with <>ST can be shared across servers (Shared Tier) and INSTANCE_TOP will be specific to Server. Next three pictures are taken from Ivo Dujmovic's presentation at Oracle Open World "Deep Dive: Oracle E-Business Suite Release 12 New Technology Stack". 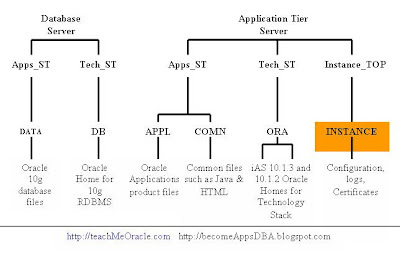 These Pictures are self explanatory & will help you in understanding Oracle Apps R12 File System. Why the New File Structure? Also, in a shared file system, MUTEX files, related to Apache, cause access related problems as IAS_ORACLE_HOME is mounted on NFS. With the new file structure, this issue is also resolved as all the configuration files can be stored on the local server instead of NFS. Notice that in the new R12 directory structure, the above dir locations do not contain the $TWO_TASK. Changes in the env file naming convenstion and environment variables. Instance top contains all the config files, log files, ssl certificates, document root etc. This is a new directory introduced in R12TS. Addition of this directory makes the middle-tier more organised, since data is kept seperate from config/log files. Another advantage is that, multiple instances can easily share the same middle tier / DB. To create a new instance that shares an existing middle-tier, just create a new instance_top with proper config files and nfs mount the middle tier in the server. For all other shared instances (1, 2, 4), $APPL_CONFIG_HOME should be set to their respective instance tops so that the config files are generated/read from $INST_TOP/appl which enables you to easily have custom config files for each env. For standalone instances, $APPL_CONFIG_HOME is set to $APPL_TOP. In that case, the config files will be in the usual location ($APPL_TOP/admin). A small set of files created by autoconfig, that are used by adpatch, are still requried to be in APPL_TOP (Context variable s_appl_config_home). Hence, in a multinode environment, $APPL_CONFIG_HOME should be set to $APPL_TOP in the node where adpatch will be run. certs is the default directory for SSL or any other certificate files used by this instance. •Details like name of the application, where it is deployed, shared libraries if any…. •Path for the j2ee-logging configuration file, RMI configuration file, JMS configuration file…. Oracle offers a new method for reporting diagnostic messages. 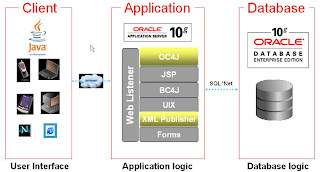 This new method, Oracle Diagnostic Logging (ODL), presents a common format for diagnostic messages and log files, and a mechanism for correlating all diagnostic messages from various components across Oracle Database. Using ODL, each component logs messages to its own private local repository. A tool called LogLoader collects messages from each repository and loads them into a common repository where messages can be viewed as a single log stream, or analyzed in different ways. Responsible for communications among the components. Only generates plain text log files. These log files are mentioned in opmn.xml. There are different levels and components for which to get detailed log. This is a server configuration file which typically contains directives that affect how the server runs, such as user and group IDs it should use, and location of other files. 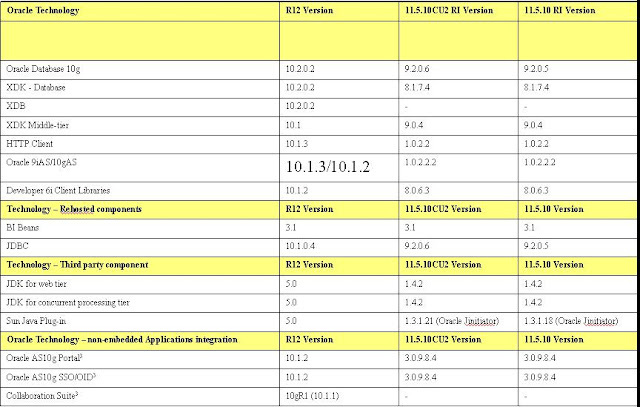 Oracle iAS DMS configuration file. 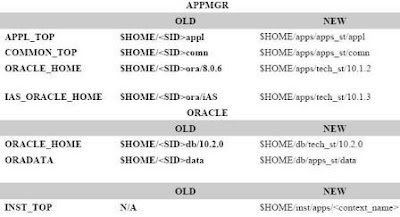 This config file enables you to monitor performance of site components with Oracle’s Dynamic Monitoring Service (DMS). OC4J Apache module config file. Usually a stub. iAS related properties in this file, like Apache home locaiton, version, server etc. OC4J properties file. Various parameters like log filenames etc are specified here. Used for applications level configuration. 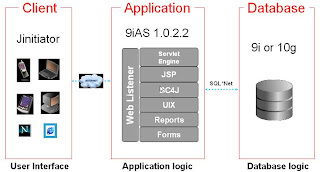 Used for specifying applications.log file location, OC4J connector context file etc. It is highly recommended that configuration changes should be done in the context file and then run adconfig. Manually changing configuration files will most likely get lost once you run AutoConfig. Also making changes to the wrong file may cause problems. The context file should be the place to make changes. These wont get lost once you run AutoConfig and the customization variables should apply the changes to the correct place. The most commonly used customization variable in your environments would probably be s_oacore_prepend_classpath. This variable can be used to preprend custom directories, jar or zip files to the oacore classpath. CDATA means character data. CDATA is the text that will NOT be parsed by a parser. e.g. : it already has the start and end tags. So the first entry in the variable starts with just the directory/file name and ends with a closing tag, and the last entry in the list omits the end tag. The others, if there are any, are complete format. The $AD_TOP/admin/template/adctxinf.tmp file contains descriptions of the context variables. This file is used to show the context variable descriptions when editing the context file via OAM.